My friends have been raving about this recipe and now that I’ve tried it I totally understand why. This is super simple – but super good. 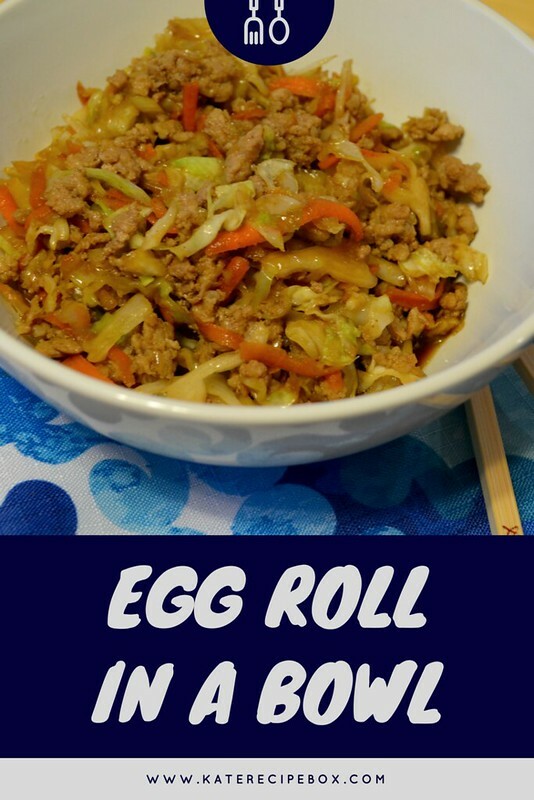 The idea here is that you make egg roll filling, but don’t go through actually wrapping it up – which is kind of brilliant. I’ve made egg rolls before, but they’re time consuming and deep fried, so they’re not something I make on the regular. 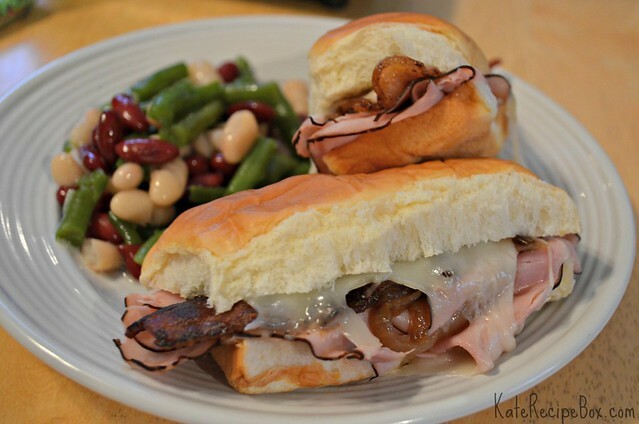 This version is lighter and perfect for a weeknight! 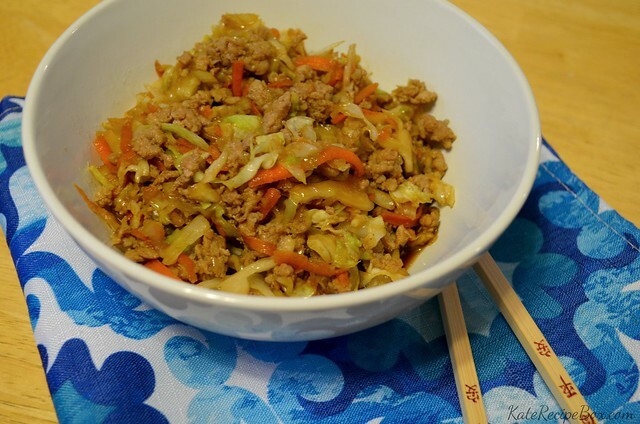 In a large skillet, brown the ground pork, breaking up as it cooks. Once cooked, stir in the coleslaw mix. Stir together remaining ingredients in a small bowl then add to the pan. Toss to coat. Cook for five more minutes, to let flavors combine. You know what I currently have a lot of? Cell phone videos of my kid gagging on green vegetables. Peas and green beans were both an epic fail, so when we got around to trying asparagus with him, I only made a few spears – I knew there would be lots of disgusted faces and spitting it out. To be fair, I don’t know if I’d be a huge fan of plain, steamed asparagus either. The asparagus in this dish, though, was awesome. My husband said it was his new favorite way to eat it. And a one pot dish = less to clean up, so this was a win all around. Another win this past week? Getting Jake to eat broccoli without gagging. I mixed it with sweet potatoes and he happily gobbled it up. Why didn’t I think of that before?! Preheat your oven to 425F degrees. On the stovetop over high heat, heat a heavy, oven-safe skillet. Add 2 Tbsp. of the oil and heat until shimmering. Sprinkle pork with salt and pepper. .Add pork to pan and cook until browned, about 3 minutes per side. Remove to a plate and cover with foil. Reduce heat to medium-high and add the potatoes to pan and cook for 2 minutes, tossing occasionally. Remove pan from heat. In a small bowl, whisk together the remaining 2 Tbsp. oil, vinegar, tomato paste and 1/2 tsp. pepper. Take 2 tbsp. of this mixture and toss with herbs de Provence, onion, and asparagus in a bowl. Add this mixture to the potatoes and stir to combine. Bake for 25 minutes, stirring about halfway. 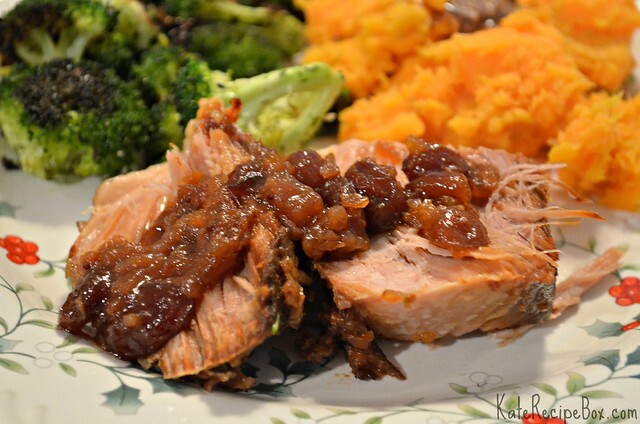 Place the pork chops over vegetables and bake until the pork is cooked through, about 15 minutes. 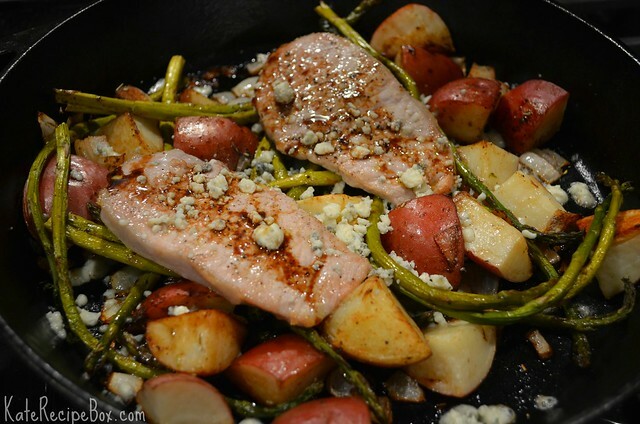 Top pork chops with additional balsamic mixture and Gorgonzola cheese before serving. Every once and a while I make something that cooks all day and makes the house smell awesome and think, why don’t I do this more often? This is one of those dishes. Pork chops and onions and bacon and apples simmering for hours before dinner? Yes. Please. I’ve made this several times, and it never disappoints. 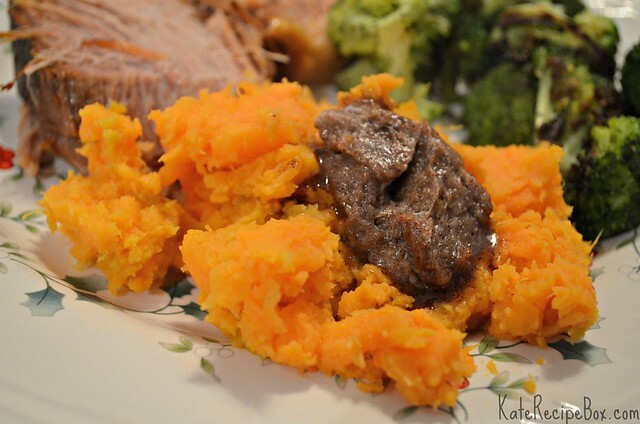 It’s making it’s first appearance on the blog, though, because it’s one of those meals that’s terrible to photograph. It’s ugly, plain and simple. But it’s delicious and you should make it anyway. Preheat the oven to 325F degrees. In a large skillet, heat the oil until shimmering. Add the onions and cook until translucent, about ten minutes. Remove to a bowl and set aside. Add the bacon pieces and fry until cooked but not crispy. Remove to the bowl with the onions and mix together. In another bowl, whisk together the flour, apple pie spice, salt and pepper. Coat each of the pork chops in the flour mixture. Add 3 at a time to the pan and sear. Remove to a plate when finished. Whisk any remaining flour into the pan. Add in the apple cider and bring to a boil, whisking often. In a dutch oven, layer as follows: bacon and onion on the bottom, 3 pork chops, apple slices, onion and bacon, 3 pork chops, apple slices, onions and bacon, and then the remaining apple slices. Pour the apple cider mixture evenly over everything. This was a pizza I made during that unintended blog break – and remade last week just so I could share it. I whipped it up to use up some leftovers and it turned out awesome – even my Mom, whom swears she hates spicy things, loved it. And I finally bought a new computer so transferring pictures should be easy-peasy going forward. Roll out dough into a 12″ circle. 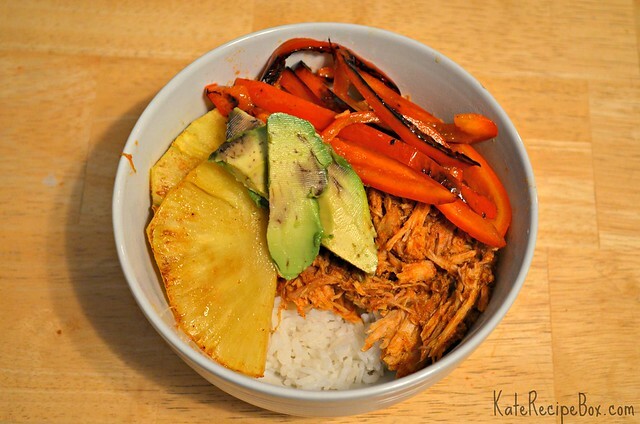 In a small bowl, whisk together the barbecue sauce and chipotle tabasco sauce. Spread over the crust. 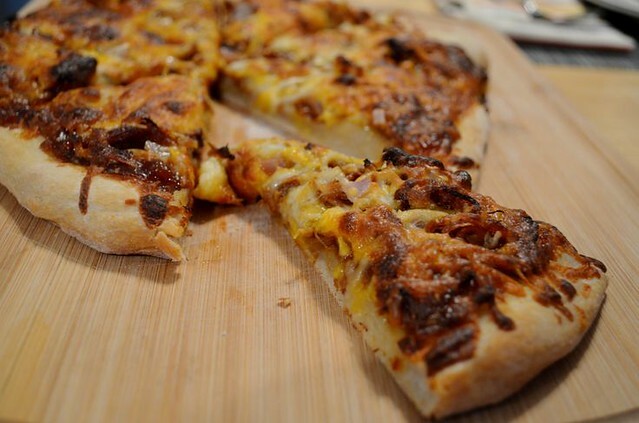 Top with pulled pork, red onion and cheeses. Bake at 425 until the crust is golden, about 20 minutes. It’s super cliché, but we’re totally on holiday detox around here. I love indulging in all the holiday goodies, but by December 26th I just wanted a big salad. Does that officially make me old? Either way, I’ve been mixing in some healthier meals during this last week. This has been one of those meals. 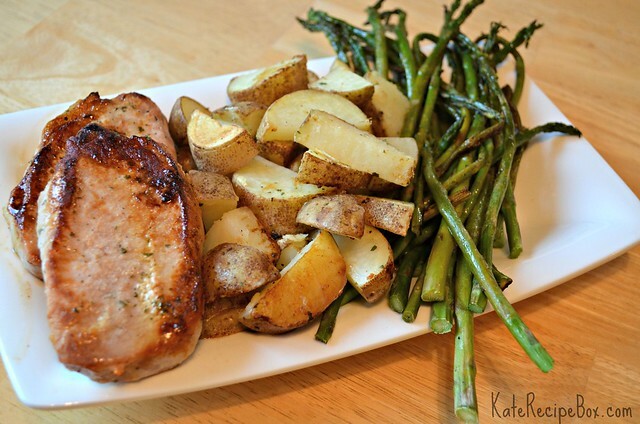 These pork chops were pretty much everything I want in a dinner lately – quick, easy and super flavorful. Mark walked in the door from work and I handed off the baby for a diaper change. By the time he’d ditched his work clothes, changed the baby and made it back downstairs, I was plating them. Win all around! In a large skillet, heat the olive oil to shimmering. 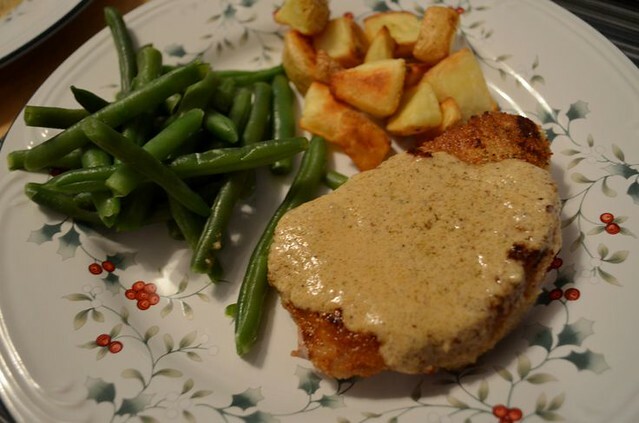 Season pork chops with salt and pepper and dredge in almond meal. Fry for 4-5 minutes per side, until golden brown. Remove to a plate and cover to keep warm. In the same skillet, whisk in the half and half, Dijon mustard, almond meal and oregano. Bring a boil, whisking constantly, and cook for 2 more minutes, until slightly thickened. Season with salt and pepper to taste.